Kent is a county and it is located in the South East of England with boarders towards Greater London to the north west, Surrey to the west and East Sussex to south West. The county also shares borders with Essex which is an estuary of the River Thames . 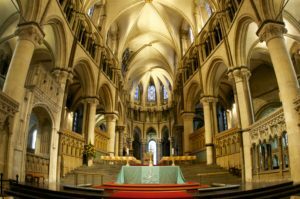 The Canterbury Cathedral which is in Kent has been the seat of the Archbishop of Canterbury, who is the head of the Church of England. Thus the county of Kent has a lot of relevance and significance in terms of a historical background and natural beauty. Another Cathedral which is of importance is the Rochester Cathedral which is also found in Medway, Kent. This is the second oldest Cathedral in England while Canterbury Cathedral is the oldest. This country has seen a lot of diplomacy ties and conflict too, ranging from the Leeds Castle peace talks to the Battle of Britain during World War too. Thus it is a region with great historical importance and hold a lot of religious prominence. The county has a lot of ports too and England relied on it to provide warships during history, the Cinque Ports of the 12 to 14th centuries and the Chatham Dockyard were of particular importance. The white Cliffs of Dover and Folkestone are important. The natural beauty too is immense, with the North Downs and Greensand Ridge spanning the length of the county. Kent is generally referred to as the ‘Garden of England’ as it has abundance of fruit growing and hop gardens. The city has an economy which is diversified and relies on tourism a lot with other sectors being haulage, logistics. Scientific research, printing and building materials form the other major sectors. Coal mining too is common. Two of the regions with outstanding natural beauty include the North Downs and the High Weald. The historical heritage of the city has given a new look on its architecture. The geographical location between the Straits of Dover and London has had an impact on the architecture along with its Cretaceous geology and its good farming land with fine building clays. The county has a proliferation of small settlements with a fringe of Cathedrals and natural beauty. The sites of Richborough Castle and Dover Castle form two of the strategic sites along Watling Street and it has been fortified by Normans and Romans. The Deal Castle, Walmer Castle and Sandown Castle were built during the medieval times.